Big wheels, fat stanchions, light weight. 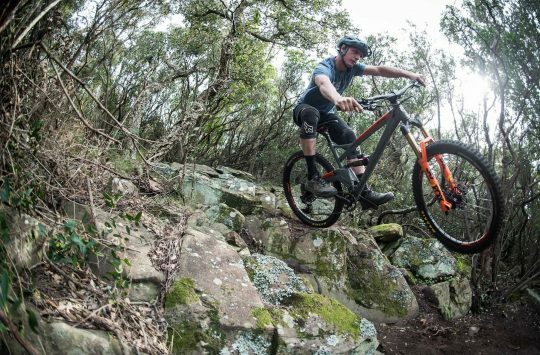 While only trail time will tell, Formula’s ThirtyFive suspension fork is among the most promising forks we’ve seen recently. 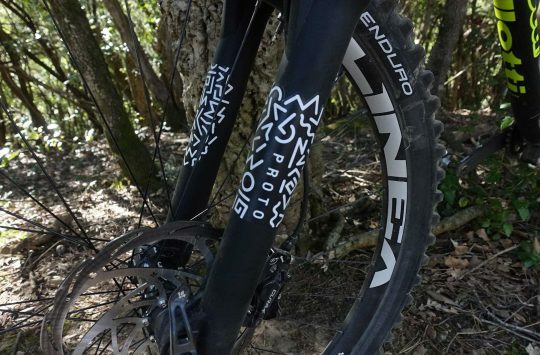 Already in production, the Italian trail/Enduro fork delivers 120-160mm of travel for 27.5in wheels or 100-140mm of travel for 29er wheels. 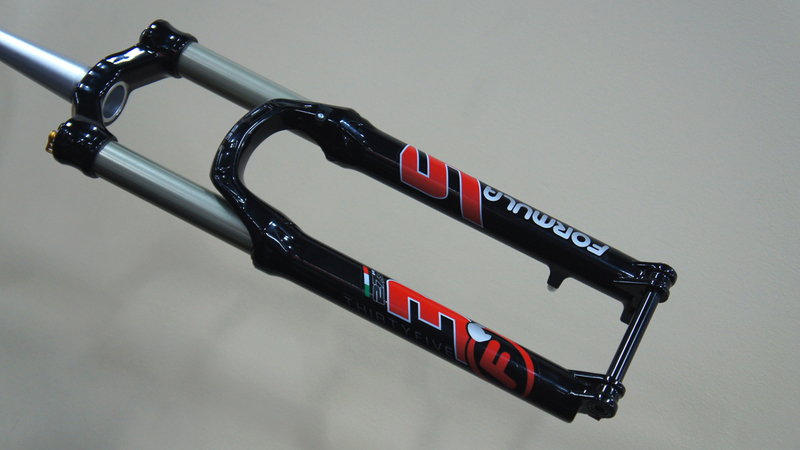 Stanchions do Fox’s 34 and RockShox’s Pike series one better, measuring 35mm across. So far, so good. What is amazing (both on paper and in person) is the forks’ weight. The 29er model is said to weigh 1,750g (3.85lb) while the 27.5 version claims 1,650g (3.63lb). Those figures would be impressive for a 32mm platform- but are incredible for anything built around such big tubes. White, if black isn’t your thing. Weight, of course, isn’t the whole story. At the top of one leg (air- and damping cartridges are interchangeable) sit adjustments for compression damping, lockout, and the damper’s threshold level. 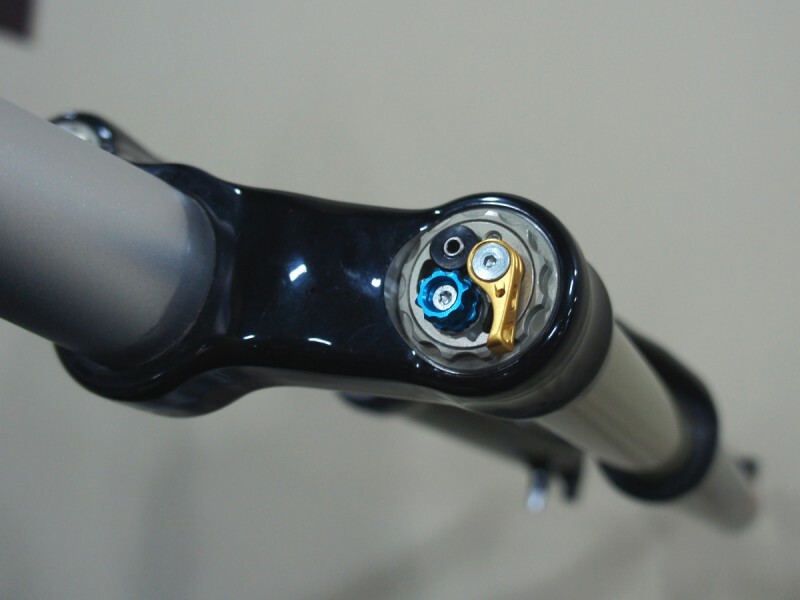 Threshold adjustment is set using the removable 2.5mm Allen knob that sits at the bottom of the leg for rebound damping adjustment. Readily-accessible Ballistol is used for stanchion lubrication and can be added to the air chamber to modify the fork’s spring curve. Updated seals are said to be less leaky than those on the smooth-but-messy ThirtyThree. Formula has made a point not to specify damper service intervals- if it’s working well, they’d just assume everything stay buttoned up. All that they ask is that the lowers be dropped, cleaned, and lubed (again with Ballistol) every 100-120 hours of riding. The ThirtyThree’s Allen key 15mm thru-axle is carried over but now includes a small tool to make for DT RWS-like function. 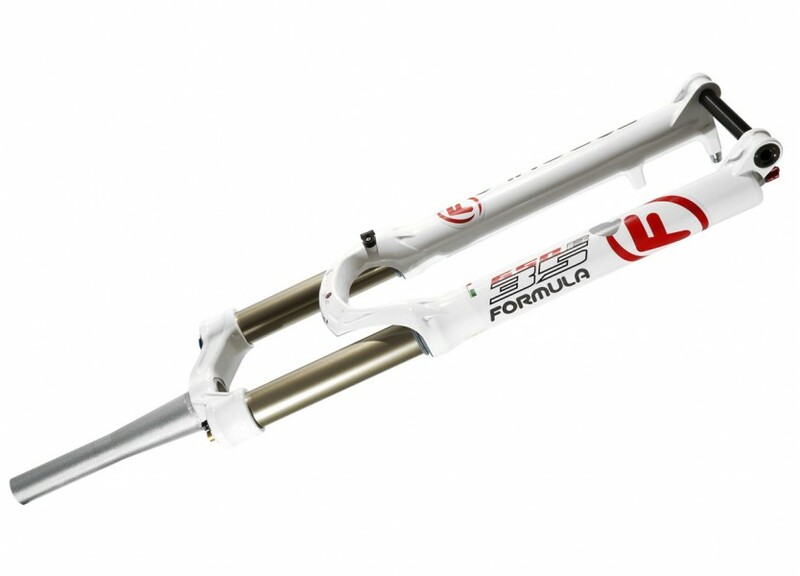 Though the forks’ internals are made in Taiwan, final assembly takes place at Formula in Italy. The company’s existing dual springs plus air assist and unobtrusive dampers could make the ThirtyFive not only the lightest, but the plushest fork in its category. 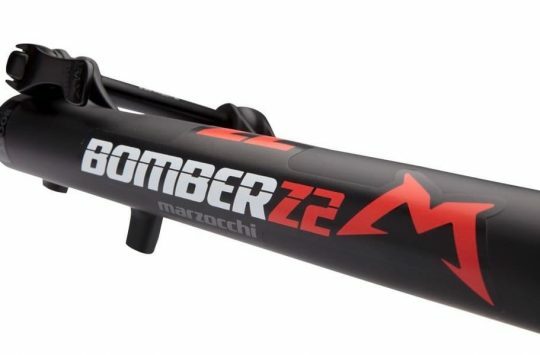 The £900/$1,350 price tag (plus £100/$100 for remote) may sound high- but there aren’t many cheaper ways to remove 2/3lb from the front of a high-end trail bike. Formula is distributed in the UK by Silverfish. Interbike 2013: A sensibly-priced Enduro helmet! I thought the Pike was 35 mm? what does ‘smooth but messy’ mean? those 33 look interesting, but I’ve seen no reviews. The Formula ThirtyThree is a freakishly light fork that’s among the smoothest that I’ve ridden. Unfortunately, the seals tend to weep a large amount of Ballistol, leaving the stanchions looking like a mess in pretty short order. It’s easy enough to wipe down, but bad enough that other riders will comment. Functionally it doesn’t seem to suffer, though. is it? sounds like a dust trap. and that stuff eats everything.